You will have “No Problem” getting these tickets. On Monday, hometown MC, Chance The Rapper announced he will be venturing out and having his own “first ever music festival” titled Magnificent Coloring Day. 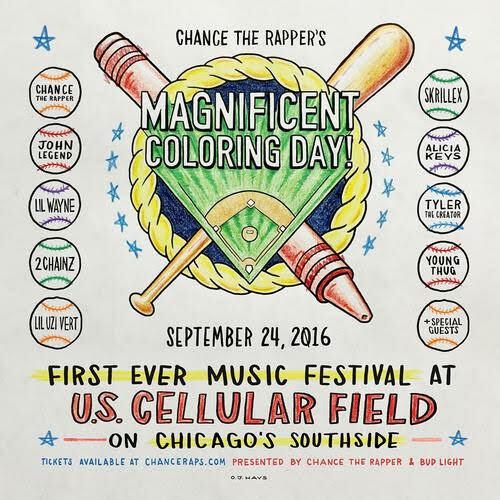 The festival is set to take place on September 24th on Chicago’s southside at U.S. Cellular Field. The festival will feature Chance The Rapper (of course), John Legend, Alicia Keys, Lil Wayne, 2 Chainz, Young Thug, Skrillex, Tyler The Creator, Lil Uzi Vert and more guests to be announced. With a stacked lineup like that, tickets are sure to sell out fast. Before tickets go on sale to the public on Friday July 29, you will have a chance to purchase tickets a day early thanks to AEG Live. On Thursday, July 28th, beginning at 10am, AEG Live will be having a presale for tickets. The presale will conclude the same day at 10pm.